The EFR3000 from Ziehl is an Intelligent Energy management and directional power relay designed to work where a local generating source, such as wind, solar, hydro or diesel generator is used alongside the grid. The EFR3000 will optimise the use of the most cost effective energy source, as well as preventing export or import when doing so would be costly or incur a fine from the utility company. The EFR3000 has three load management outputs which can be used to start loads to consume excess local produced power and further reduce energy costs. The optimisation of locally produced energy can be complicated, not just because of the variability of solar or wind, but also the type of loads on the systems. A system with dryers, heaters, or heavy but not constant loads such as washers, can make the energy management functions complicated. The EFR3000 can be configured to monitor and manage the energy usage on these loads and will allow loads such as dryer and washer to complete their run cycles rather than simply shutting them off when the energy profile alters. The EFR3000 optimises the loads even in difficult and challenging states. The EFR3000 has a directional current protection circuit, which will alarm when the power is either being exported or imported contrary to the connection agreement with the utility company. Being a true 3 phase current monitoring device the EFR3000 will respond if the current flow is incorrect on any of the three phases. 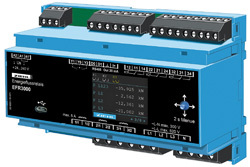 There is an analogue output for the kW which can be fed into a BMS system or other monitoring devices as well as MODBus communication, all as standard. The EFR3000 is configuration file is created via an online programming tool which is then saved locally and uploaded via the mini USB port. It can also be programmed locally via the front joystick and menu.